This year’s program for Bike Week was jam-packed with fun. Over at the LADOT Bike Program, we made sure not to miss any of the wonderful opportunities to get up and out with Metro and our bicycle partners, propagating bike love across LA throughout the week. Seleta Reynolds, LADOT General Manager, knocks our socks off at Grand Park’s Bike Week 2015 Press Conference on Monday, May 11. Image: Jose Tchopourian. LADOT General Manager, Seleta Reynolds, kicked off Bike Week 2015 with a group ride into work. She led a group ride of LADOT employees from Echo Park to LADOT headquarters in Downtown. Next stop: the Bike Week kick off press conference at Grand Park! The press conference was star-studded with #bikeLA VIPs including Councilmember Paul Krekorian, Councilmember Jose Huizar, Metro’s day 1 on the job new CEO Phil Washington, Metro boardmember and L.A. County Supervisor Hilda Solis, Caltrans’ District 7 Director Carrie Bowen, LACBC’s Executive Director Tamika Butler, CICLE’s Executive Director Vanessa Gray, Good Samaritan Hospital’s Andy Leeka, and CicLAvia’s Aaron Paley. Also, lots and lots of cameras and media from local news channels. Later that day, Metro hosted the “Is Bicycling In Your Future?” panel moderated by Frances Anderton, host of KCRW Design and Architecture and daily bicycle commuter. The panel featured Laura Cornejo, Deputy Executive Officer at Metro; Maria Sipin, Advisory Board Member of Multicultural Communities for Mobility; Tamika Butler, Executive Director of Los Angeles County Bicycle Coalition; and Sergeant Mike Flynn, LAPD Central Traffic Division Bicycle Liaison. Panelists explored whether bicycle ridership will increase as viewed through the lens of engineering, enforcement, and encouragement. We did some math on this and… short answer: YES, bicycling is in YOUR future! Tuesday opened with the 12th annual Blessing of the Bicycles! As usual the Blessing was at the Downtown adjacent Good Samaritan Hospital, accompanied by a delicious breakfast. During the morning, fallen bicyclists and advocates were recognized. Then religious figures literally bless bicyclists as they ride by, ensuring them a safe passage throughout the year. The 12th annual Blessing of the Bicycles hosted by the Good Samaritan Hospital saw a large number of participants and a new recipient of the Golden Spoke Award. Image: Joe Linton/Streetblog LA. Wednesday’s Bike-In Movies defied inclement weather (by LA standards) by attracting a park full of people on two wheels and their fascinating chair-and-blanket contraptions. Danny Gamboa of Ghost Bikes and Metro’s Jack Moreau MC-ed the night. The shorts ranged from animated critters dealing with aggressive cartoon cars to the very solemn stories of families who have lost loved ones and found peace through the Ghost Bikes movement. Bike-In Movie Night at Marsh Park had a full house, with over 100 people showing up on bikes. Image: East Side Riders BC. Thursday was Bike to Work Day! This event featured hundreds of pit stops across LA County. Our very own LADOT Bike Program’s pit stop hung out with the Caltrans pit stop in front of our headquarters at Main and 1st Street. Commuters came for the freebies and stayed for fun! We offered snacks, information, and other cool bike swag. We had many special pit stop visits including Tamika Butler and Eric Bruins from LACBC, First 5 LA, former LADOT Bike Program superstar Jon Overman, and a news crew from Biola University. Later that night, creatives from across the region shared their bicycle-themed artwork with LA Metro for the Color Wheels Art Show. The reception was held at the Caltrans Building, coinciding with DTLA Art Walk. Food, music, and prizes, as well as the really cool bicycle art, helped fill the room. If you haven’t yet visited the exhibition, don’t worry, the show will be open all month! One of our favorite pieces was the fish skeleton stuffed with trash found in the LA River (Bicycle Coordinator Rubina Ghazarian not included in the art piece). The piece shows not only that our bike lanes are large enough to accommodate a giant fish towed via bike trailer from Burbank, but that we need to take better care of our streets, rivers, and oceans! Bike Night at Union Station was the BEST! The event was hosted in the Old Ticket Room in Los Angeles’s most historic train station. 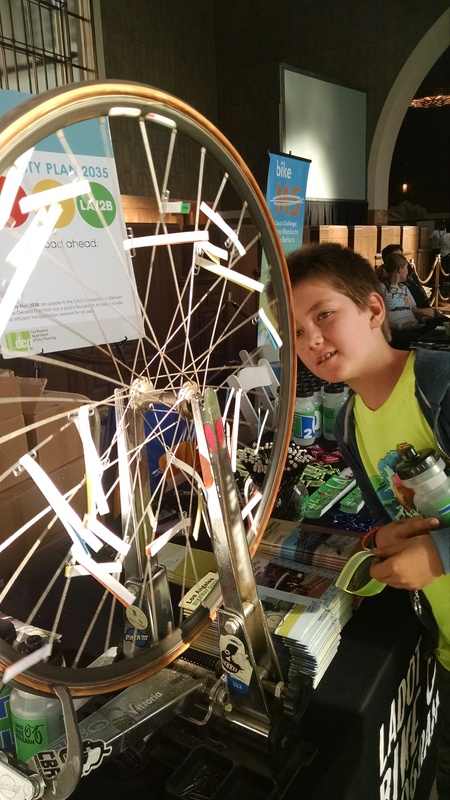 We don’t want to gloat, but our LADOT Spin-the-Bike-Wheel was pretty cool! The trivia contest was all the rage, with people lining up again and again for an opportunity to prove their #bikeLA cred and win special prizes. We were extra proud to see how many young people were winning at the Wheel, exhibiting some serious street knowledge… You go, #bikeLA! Image: Jose Tchopourian. Most exciting for us though was our opportunity to debut our brand new Bikeways Guides, hot off the presses from the print shop! We distributed hundreds of our new maps, updating people with the first new guide since 2011! Bike Night was also full of music, food trucks, a photobooth and sweet prizes for everyone courtesy of Metro and sponsors. Free bike valet and tune-ups services were offered by Fleet Streets. Once again, Bike Night has proven to be the champion of all Bike Week wrap-ups. Karina and Ben holding down the fort and thrilling crowds with Spin-the-Bike-Wheel! Image: Jose Tchopourian. Talking the talk and walking the walk, we want to share what some Angelenos did during the week. A bike ride held by UCLA Urban Planning students and alumni (and former familiar faces from the Bike Program) visited NoHo Arts Districts, Chandler Bike Path, Griffith Park, LA River Bike Path, North Atwater Park, and Golden Road Brewing on Saturday, May 16. Across the City and beyond, many other rides took place during the week. Please share with us what you did during Bike Week in the comment section! This group of UCLA students and alumni got together and rode from NoHo to Golden Road Brewing. Image: Jose Tchopourian. Bike Week hooks you up with the events and people to begin or continue your bike journey! And probably most importantly, it provides you the tools to navigate the streets of Los Angeles by bicycle safely. Sadly, Bike Week 2015 has ended, but the fun continues because May is Bike Month! Ride safely and we hope to see you on the road whether it’s Bike Week or not because at LADOT every week is Bike Week! Bike Week is over, but we’re still celebrating! After over a year of design and development, we have completely redesigned our Bikeways map for a new and vastly improved 2015 edition! Last week we picked up our maps from the print shop and will begin distribution to libraries, bike shops, co-ops, and Council District Offices. Legend has it that before the LADOT Bike Program was established, over 25 years ago, LADOT engineers would mail hand-drawn maps of the City’s then sparse bikeway network to people that requested bikeway maps. When Senior Bicycle Coordinator Michelle Mowery arrived at LADOT in 1994, she quickly realized the dearth of bicycle resources for the public. Bike maps were a constant request and Mowery advocated for the LADOT Bike Program to produce a guide to the City’s bikeway network with maps, tips, and community resources. Since 2000, the City of Los Angeles has provided sophisticated public bikeway maps by producing and distributing the Los Angeles Bikeway Guide, an educational resource that encourages people of all ages to ride bicycles safely and with confidence in Los Angeles. The City prints three versions of the Bikeway Guide–Central City/Westside, Valley, and Harbor–to make sure maps are available, in print, at a legible scale for the entire city’s bikeway network. 2011 marks the last significant design or informational revision to the Los Angeles Bikeways Guide. If you have attended any of our outreach events in recent years, you probably have this outdated copy in your pannier or stuffed inside your kitchen drawer. Perhaps it rests as a historic relic on your wall. Behold! After an entire year of design, collaboration, and a brief stint of working with our LADOT People St Program, our in-house graphic designer and urban planner, Karina Macias, has completed a brand new Los Angeles Bikeway Guide! The Guide includes useful information on bicycle safety, riding etiquette, bicycle-related laws, local organizations and resources, and of course an up-to-date map of the City’s current bikeway network to help you plan your trips. With the help of City of Los Angeles Publishing Printing Press Supervisor Ron Gallegos, this third edition of the Bikeway Guide is brighter and more colorful than ever before. Along with a new look and feel, this 2015 update includes new content informed by our entire team’s experience and background, including pointers on bicycle maintenance, tips for bicycle commuting, and updated local information. We hope you are as happy with this new edition as we are! Collect all three Bikeway Guides and combine them to create one giant citywide map! UPDATE: Oops! Our bad. 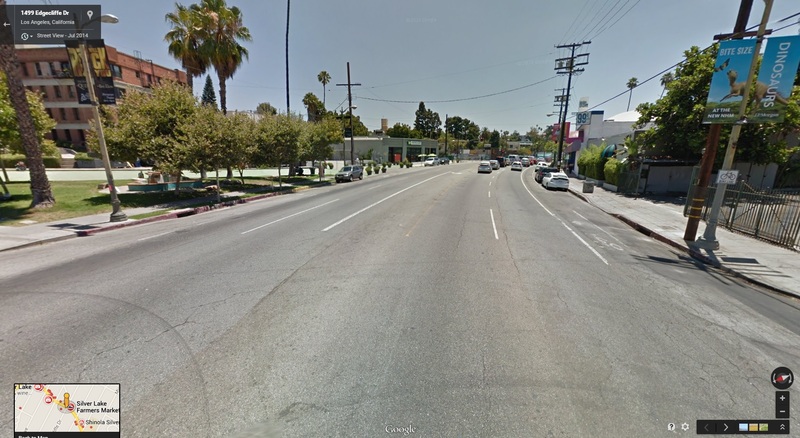 Looks like our new protected bike lane on Reseda Blvd. is mistakenly shown on Winnetka Ave. in the printed map for the Valley region. What a great time to introduce #UpdateYourMapLA! Edit your map to show a correction or a new facility with a thick marker. Draw over the map in the color coded system shown on the map’s legend. LADOT will periodically post #UpdateYourMapLA alerts. If you miss the alerts or want to take matters (markers?) into your own hands, as always, for the most recent version of our map, check our website. Thanks for all the support #BikeLA. Spring (or is this one long perpetual summer?) is back and adventure options for those on two wheels are endless! After travelling to a few other places, we wanted to get back on our local tourism tip! This bicycle tour features destinations in between the Red Line North Hollywood Station (in NoHo) and the Griffith Park Sunday Drum Circle. Yes, a drum circle! This 8.5 mile-long bike ride travels along different bike facilities (bike paths, lanes, and routes) and features a variety of LA neighborhood attractions from shops & entertainment in NoHo to nature & culture in Griffith Park. Come along for the ride! To prepare, you need: a bike, a bike lock, some kind of map or smart phone, water, snacks, and don’t forget your sun protection, because it can get HOT! 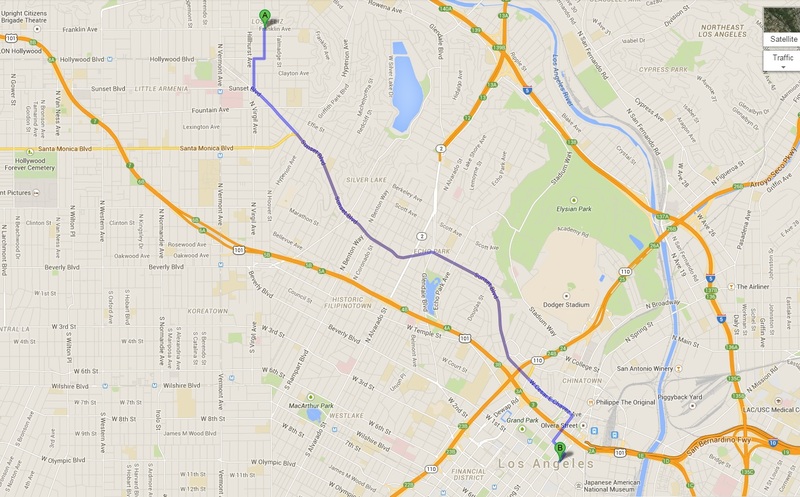 My Bicycle Route: Los Feliz to Downtown with Special Guests — LA Bike Trains! My favorite means of commuting to and from work has always been by bicycle, and my commute to LADOT is no different. For many bicycle commuters, the decision to bike to work is often because they find the convenience, affordability, enjoyability, and commute time appealing. Biking also takes away the stress of having to rush to catch the [insert any public transit mode] or the all-too-familiar road-rage-inducing traffic congestion. I live in Los Feliz and it takes me an average of 35 minutes to bike to work Downtown. In total, the ride is about 5.5 very doable miles. If I were to commute by car it would take me roughly 40 minutes plus a few bucks for gas (and then… parking). There are a few bike routes I can take to work because of the growing bike lane network leading to and through Downtown and the route I take most often is straightforward, based in two prominent north/south and east/west bike network connectors: the 2nd Street tunnel and Spring Street bike lanes. From my home, I use neighborhood streets to reach Sunset Boulevard, then take Sunset (more than half the ride), and finally catch the bike lane on Spring Street to the reach the LADOT office. My ride starts out in the quiet Los Feliz flatlands, where I weave through neighborhood streets and a few mid-block alleyways. I enjoy the slow pace I can take in the alleyways that feature limited vehicle traffic- their separation from major roadways allows me to relax and take it easy. I also enjoy the sense of community here. There are several schools in Los Feliz, so I routinely see a lot of moms and dads walking their kids to school or older kids walking together in groups. When I reach Sunset, I take the popular Sunset bike lane for an easy 4.5 miles through a couple different neighborhoods: Silverlake and Echo Park. Biking on Sunset is my favorite part of the ride because it is scenic, varied, and social. There are a few rolling hills, but all elevation climbs are manageable and are subsequently rewarded with fun, gentle downhills. To my surprise, Sunset Blvd. in the mornings doesn’t ever seem as busy as it usually is in the evenings and on weekends. 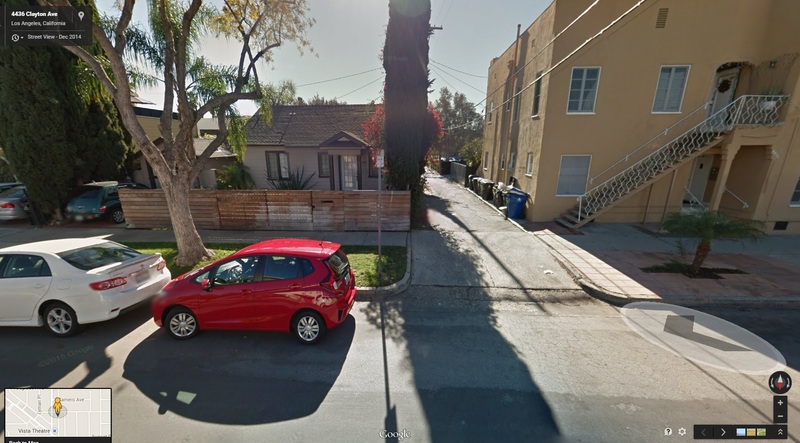 Silverlake and Echo Park have a lot of locally beloved coffee shops. They’re always in full swing with people enjoying their favorite morning pastries alongside a cup of joe. Mornings along Sunset are also bustling with the bigger business of everyday life- there are always a few freight trucks unloading, buses picking up and dropping off people on their way to work. It’s important to follow the same rules of the road with these larger vehicles. When they are stopped to unload, I pass them safely, on the left. With busses, sometimes I slow down and wait behind them until they exit the bus zone. Patience and common sense are important when sharing the road! When the weather is rainy or just too cold or too hot, I’ll opt for a multi-modal commute. For these rides, I dress according to the weather and bike to the nearest Metro Red Line Station, taking my bike on the train. From the Red Line, I get off at Civic Center Station, and then bike the rest of my way to work. 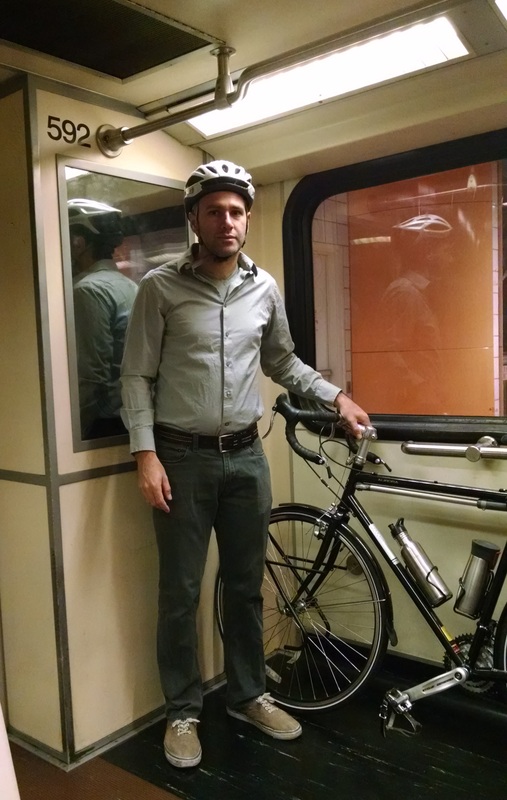 Like Jose mentioned in his previous My Bicycle Route post, taking your bike on the train is super easy. In addition to using other modes of transportation to supplement biking, I’ve also learned a few wardrobe tips to make my trips more successful. These include: 1) layering 2) wearing comfortable or slightly stretchy clothes to allow for lots of leg movement 3) cuffing pants to avoid greasy chain smears and, 4) adorning a reflective strap or vest for safety. Storing work clothes and extra gear like a multi-tool, bike lights, and flat tire patch kit in a pannier will also help ease your ride and facilitate a safe trip. Elevation inclines and declines: Dress and prepare accordingly. Bicycle infrastructure: Paths, lanes, sharrows and their varying degrees of safety, connectivity, and ease. Vehicular traffic and speeds: Neighborhood streets often yield slower vehicle speeds while main thoroughfares often yield higher vehicular speeds. Time of the day: Make sure to use the proper lights and reflectors to make yourself visible. Keep in mind that one of the best ways to pick your favorite route is to simply go out there and take a few test rides. You can even drive the route in a car ahead of time. Have fun, and let us know what your favorite rush-hour-beating bike commute route is! Heather Do is an intern in Active Transportation Division’s Bicycle Program. /wp-content/uploads/2015/04/los-feliz-downtown.jpg 410 660 LADOT Bike Blog http://bike.lacity.org/wp-content/uploads/2015/04/tempBikeLogo2.jpg LADOT Bike Blog2015-04-03 15:47:112016-04-11 17:42:23My Bicycle Route: Los Feliz to Downtown with Special Guests -- LA Bike Trains! My bicycle route is mainly on neighborhood streets, providing a lower-stress and more pleasant experience. Jose Tchopourian, LADOT Bike Program. The Los Angeles region is vast and challenging to navigate by any transportation mode. Some residents, like myself, find it more enjoyable and oftentimes faster to commute using a bicycle alone or in combination with public transit. Before guiding you through my “hybrid commute”, which combines bicycling and transit, I would like to point you to some helpful resources for making trips by bicycle: bike maps and infrastructure, transit maps and timetables, bike rules of the road, and fun bike rides and education. Since September, I have been commuting from my home in the NoHo Arts District to class at UCLA’s Urban Planning Department. My trip combines a bike and Metro’s underground Red Line subway. The total commute is 14 miles long and takes about 1 hour door to door. I start my trip on the Metro Red Line at the North Hollywood station in the direction of Union Station. I ride the train two stops, departing at the Hollywood/Highland station. The train ride takes about 9 minutes. If you are riding Metro Rail with your bike, keep the following in mind: 1) use elevators or stairs to enter and exit stations 2) if the train is full, wait for the next one 3) give priority to passengers in wheelchairs, and 4) stand with your bike in the designated area for bikes, which are clearly identified with a yellow decal adjacent to the car doors. Holding my bike while riding the Red Line Subway into Hollywood. The second part of my commute, an 8-mile bicycle ride, takes about 45 minutes and allows me to experience the sights and sounds of multiple neighborhoods.It is important to follow the rules of the road while operating a bicycle. Obey all traffic signals and stop signs, yield to pedestrians, and use lights to be visible at night. I find that riding predictably and communicating with other road users makes my ride safer. The route I have selected avoids steep mountainous terrain. Instead, I experience slight inclines during my trip. In addition to elevation, I also consider the type of streets I will be using to get to my destination. Eight years of using a bicycle for moving through Los Angeles have taught me that safety comes first. Even if riding on arterial streets might bring me to my destination a few minutes earlier, I prefer to trade time saving for the lower-stress experience of riding on residential and neighborhood streets. When I do ride on arterial streets, I pick those that have bike facilities on them. Here is my route. If you see me on the road, say hello! If you would like to share your favorite route, send it to bike.program@lacity.org.